An eco-friendly UK dairy farmer is set to harvest an annual return of up to £8,000 a year after installing a new wind turbine. The 10kW Evoco turbine from Ploughcroft Renewables will enable Uriah Godsell to make a significant saving in electricity bills on his dairy farm, near Stroud, Gloucestershire. Mr Godsell not only wanted to save money on running his milk equipment, cooling units, lighting and generating hot water, but he required an eco-friendly energy source that would complement the farm's existing renewable energy. He says, "This is just the latest in a series of measures that will make our farm less reliant on electricity from the grid. "We expect that we will be able to generate two thirds of our total energy usage ourselves, which will create a modern farming unit with a much lower environmental footprint. Ploughcroft was very efficient and installed the turbine in just one week. We are looking forward to being able to reap the benefits of this greener, cleaner source of energy." The farmer initially read about the turbines in a farming magazine. He then visited some Evoco installations and was impressed with the turbine design, quiet operation and efficiency. Finally, he obtained planning permission. The 15metre (49ft) turbine took Ploughcroft Renewables, a UK solar photovoltaic (PV) installer, just a few days to install in a field that overlooks the River Severn. The turbine generates 21,100 kWh per annum when the wind is at 5meteres per second. When other renewable technologies are taken into account, including solar thermal and solar PV for the house, a biodiesel system and wood pellet burner, the farm could reduce its energy usage by two-thirds and the equipment could pay for itself in between 2.5 and 4.5 years. Chris Hopkins, Managing Director of Ploughcroft Renewables, says, "This is our first wind turbine installation for Evoco as we extend our range of renewable services into this area. 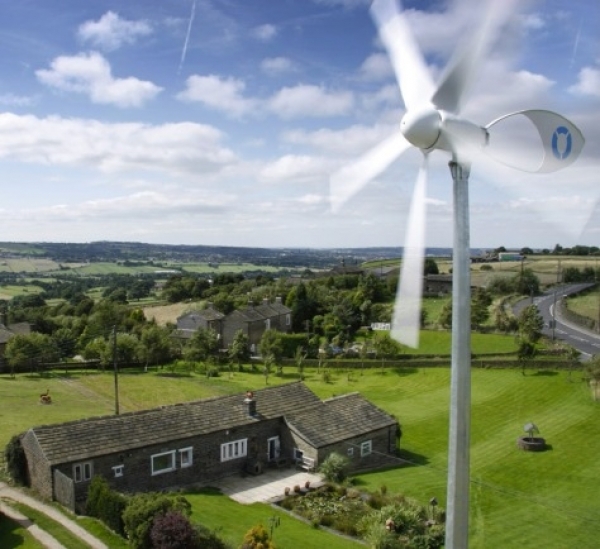 Many farmers are recognising how wind turbines provide an attractive return on investment, particularly with a business like this that is a heavy user of electricity." Ploughcroft has won many regional and national awards, including being named Best in Britain by the Microgeneration Certification Scheme, an Innovation in Training award from the National Home Improvement Council and a Best Green Initiative honour from the National Corgi Awards. Its head office is in West Yorkshire. Free PC Energy Saving Software - need more info first?